"Markets (and people) can remain irrational far longer than you or I can remain solvent (or sane)." When thinking about the equity markets here and their divergence from the rest of the pack (currency, commodity and credit markets), I have a hard time seeing the impetus for what will be required to have the "Three C's" come eye to eye with the equity markets perspective. Over short timeframes, stocks tend to be the most insensitive asset class to their surroundings. Going on a bender while the other parties prepare for a wake is certainly within their psychological profile. I am speaking through my own biases of course, but if I was a bull, I would feel more comfortable if the market had traded in concert with a declining euro or a strengthening Treasury market and was loaded with heartbroken sentiment for the next pivot. Markets can jump with great elasticity if the bus is crowded to one side. My point being, even if the euro decides to bounce like any dead cat can - the amount of reflex in equities will likely be muted because the sentiment picture has become so exuberant. Below is a fractal study of 10 year Treasury yields that compares its past year trajectory with the SPX from the 2008/2009 timeframe. 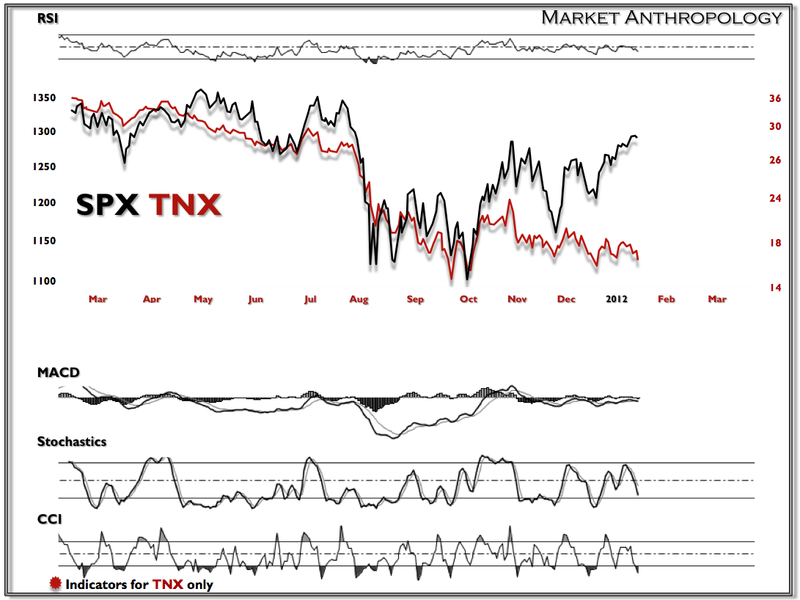 As apparent in the chart, both markets have corrected with very similar structures, proportions and momentum signatures. 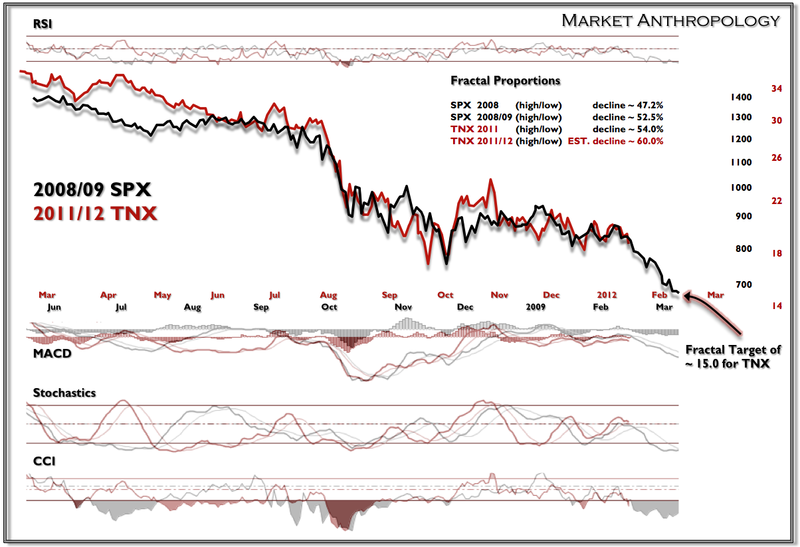 If the fractal proves prescient for TNX, and considering that in the past Treasury yields have typically bottomed before the equity markets - the relationship between Treasuries and equities will be restored by Valentine's Day - with what could only be considered a very painful hangover for stocks.